Biotinylated Human ITGAV & ITGB1 Heterodimer Protein (IT1-H82W6) is expressed from human 293 cells (HEK293). It contains AA Phe 31 - Val 992 (ITGAV) & Gln 21 - Asp 728 (ITGB1) (Accession # NP_002201.1 (ITGAV) & P05556-1 (ITGB1)). Human ITGAV & ITGB1 Heterodimer Protein, produced by co-expression of ITGAV and ITGB1, has a calculated MW of 114.7 kDa (ITGAV) and 83.7 kDa (ITGB1). Subunit ITGAV is fused with an acidic tail at the C-terminus and followed by a polyhistidine tag and an Avi tag (Avitag™) and subunit ITGB1 contains no tag but a basic tail at the C-terminus. The non-reducing (NR) protein migrates as 135-150 kDa (ITGAV) and 100-115 kDa (ITGB1) respectively due to glycosylation. Lyophilized from 0.22 μm filtered solution in 50 mM Tris, 150 mM NaCl, pH 7.5. Normally trehalose is added as protectant before lyophilization. 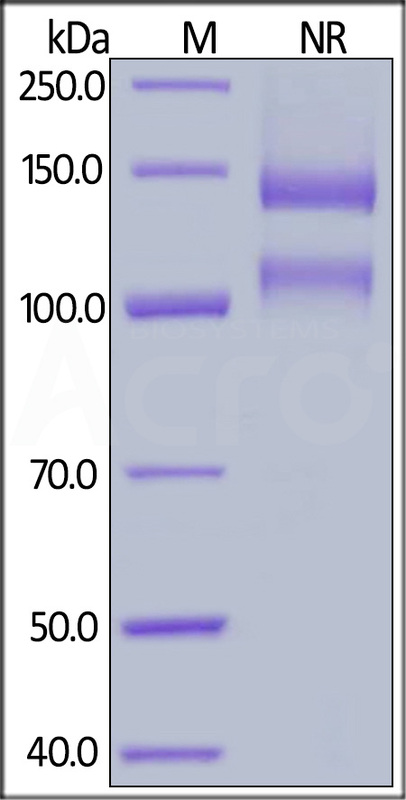 Biotinylated Human ITGAV & ITGB1 Heterodimer Protein on SDS-PAGE under non-reducing (NR) condition. The gel was stained overnight with Coomassie Blue. The purity of the protein is greater than 95%. 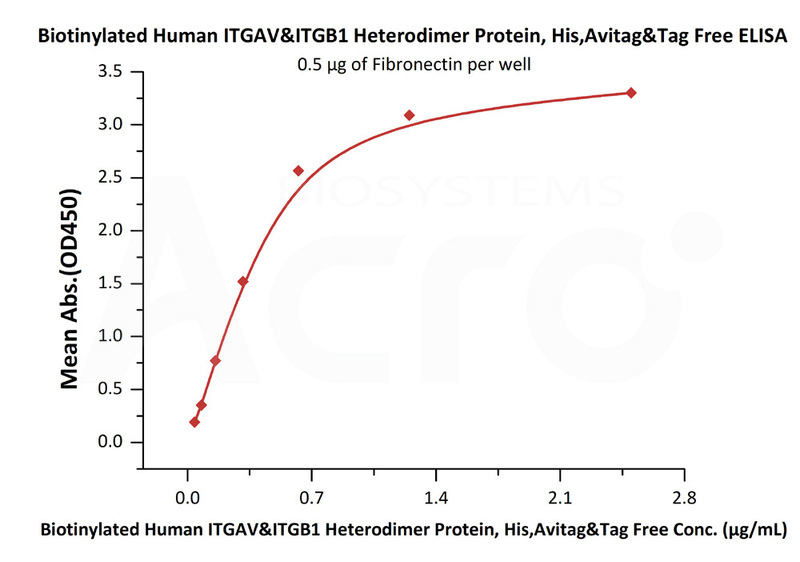 Immobilized Fibronectin at 5 μg/mL (100 μL/well) can bind Biotinylated Human ITGAV & ITGB1 Heterodimer Protein (Cat. No. IT1-H82W6) with a linear range of 0.039-0.625 μg/mL (QC tested). Integrin alpha-5/beta-1 is a receptor for ibrinogen. Integrin alpha-1/beta-1, alpha-2/beta-1, alpha-6/beta-1 and alpha-7/beta-1 are receptors for lamimin. Integrin alpha-4/beta-1 is a receptor for VCAM1. It recognizes the sequence Q-I-D-S in VCAM1. Integrin alpha-9/beta-1 is a receptor for VCAM1, cytotactin and osteopontin. It recognizes the sequence A-E-I-D-G-I-E-L in cytotactin. Integrin alpha-V/beta-1 is also a receptor for vitronectin. Beta-1 integrins recognize the sequence R-G-D in a wide array of ligands. Isoform 2 interferes with isoform 1 resulting in a dominant negative effect on cell adhesion and migration (in vitro). When associated with alpha-7/beta-1 integrin, regulates cell adhesion and laminin matrix deposition. (1) Balzac F., et al., 1993, J. Cell Biol. 121:17. (2) Sasaki T., et al., 1998, EMBO J. 17:1606-1613.